Apologies for the lack of blog posting lately, it sounds so cliched but I don’t know where the time goes! I can’t believe we have been in our house for nearly 8 months. It definitely feels like home. Of course I love its aesthetics but one of the biggest pluses is that it works for our family. There is a place for most things and it flows really well. I like to think that this is not a fluke and that my planning in the design phase helped. I initially did a thorough stocktake of what would be coming with us to this house so that I could be sure everything had a place. I considered our routine and how the layout could best work. Although storage was high on my priority list, I didn’t want to compromise the style of the house as a result. Therefore a majority of the cabinetry is built in and complements the classic style of the house. Here are some of my Tips For Designing An Organised Home which can apply to a renovation or full new build. Working from home, I knew I wanted a space that I felt good in but also where I could be organised. I included shelving for brochures, books, magazines and knick-knacks. But I also added filing drawers and cupboards for additional storage. During the design phase, I itemised all my kitchen appliances and kitchenware so that I was sure everything has a place. I especially love the drawers. After having cupboards in our last home, drawers are so easy to access and see everything at hand. I included a condiments cupboard adjacent to the stove which is very handy for cooking. Call me crazy but the bin drawer is one of my favourites. It has a place for regular rubbish, recycling and compost. Shelves galore was my brief in here. I love having easy access to all the pantry items and Tupperware. I can do a quick stocktake before the grocery shop. The girls also have their own tubs with their lunch boxes and containers so that school lunch preparation is as fuss-free as possible!. The end cupboard houses a special spot for one of my favourite gadgets…..my Dyson stick vacuum. It gets daily use for quick clean ups and this spot with a specific power point ensures it is always charged. On the adjacent wall I created a home for the microwave, wine fridge and coffee machine. I joke that I would be happy to be locked in my pantry with all my vices (including a chocolate stash)! For more tips on designing a butler’s pantry, check out my previous blog post (here). Tucked behind the kitchen is my ‘mum desk nook’. This space helps me keep all the paperwork such as school newsletters, bills and mail under control. I have folders in the hidden shelving behind the appliance cupboard where (I try) to keep everything filed. The Alldock station keeps the devices in one spot. We all use the Pottery Barn Daily Wall System as a weekly calendar. I have the magnetic whiteboard and whiteboard calendar. I have tried other family calendars in the past but this system has been the best so far. One of my pet peeves was school bags lying around the kitchen and dining table. The mud room has been the perfect solution. Situated next to the garage, each girl has their own nook with a hook for their school/sports bag and blazer. The drawers underneath house runners, library bags etc. The cupboard on the left is for coats. The laundry is one room that I needed to work well and somewhere I hoped to spend the least amount of time. I included two deep drawers for light and dark dirty clothes. The tall cupboard to the left is a drying cupboard with an air vent for winter months (I was happy to farewell the clothes horse!). On the right side of the room are tall cupboards for linen. An additional cupboard has a divider to neatly fit the ironing board and a low shelf to store a washing basket. Although not part of the actual house design, I made sure there was ample wall space for these library shelves that have ended up in our bedroom. You might remember them from my Stylish Toy Storage post (they were originally painted black). Unfortunately between moves and being in storage they got very damaged. I couldn’t bear to see them end up as scrap so I found someone who re-painted (in Dulux Diplomatic) and repaired them. The shelves are constantly changing and I love having another space for my treasures to be displayed as well as some closed storage underneath. My favourite part of the ensuite is the mix of shelving, drawers and cupboards. It means that everything is easily accessible. I have used Ikea Tillsluta tubs inside the drawers to store similar items together. The cupboards contain baskets to hold the hair dryer and straightener and all my lotions and potions are standing in the shelves. On either side of the fireplace I included cupboards to store items such as photo albums and the kids’ games. The end cupboards have a wire mesh panel for storage of the DVD player. With the girls’ rooms, I was looking for a streamlined look with joinery built in. Miss 12 who is my ‘minimalist’ and more organised one has shelving and drawers. Extra bedding and all her previous years’ school work (that we never know what to do with) is stored under the window seat. I also designed a hidden book nook for her. Her request for the colours in her room was ‘no pink’. I managed to sneak in these cushions under the guise of ‘coral’! Miss 9’s colour request was ‘mint and raspberry’. Her 4m long desk has ample storage and of course she has managed to fill the drawers and cupboards. She has a lovely view of the city from her window. On the initial plans, this space was a void at the top of the stairs. I saw it as the perfect opportunity for (another!) window seat. Again, the deep drawers underneath are perfect for storing blankets and bedding. Complete a full stocktake of what you want to put in a room so that you can ensure there is a place for everything. This includes smaller items inside drawers/cupboards. Think about how your family will use the space, your hobbies/activities and what is important in your day to day lives at home. Consider whether drawers, cupboards or shelving are the best option for want you want to store. Look at void areas and walls where storage could be included. Use Pinterest to gain ideas and inspiration. Engage a designer to advise on creative ways of incorporating stylish and functional storage to your home. I would love to hear of anyone else’s tips. Good luck! 20 Responses to "Tips For Designing An Organised Home"
Just had to forward this to my daughter currently planning a new family home. Great storage ideas for every part of the house- loved them all but very taken with “school bags and blazers” section. I have very vivid memories of being driven nuts by those many years ago! You can never have enough storage!! We have just done our kitchen and I LOVE my bin drawer!! Also am pretty obsessed with my ‘Magic Corners’ – no more items getting lost in kitchen corners! You’re home is stunning BTW! Hi Belinda, this post was great timing as we have just finished designing all of our spaces with our cabinet maker. I was very relieved to see many of your great ideas in our current design. 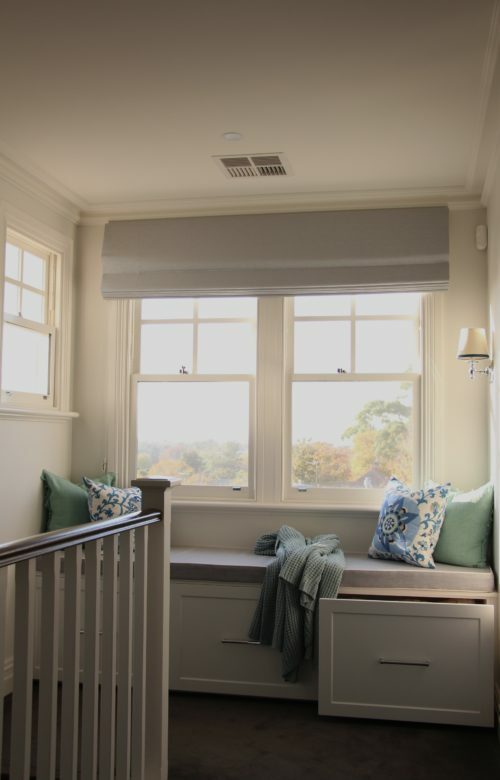 I love the book shelves in your daughters’ bay-window box seats, that is definitely an inclusion that is going on our plans now for our daughter’s room, thank you! I will upload our designs and details to my blog if you are interested in some of the little ideas we have come up with. You are so designing my next house!! Hi Belinda, my blog (which is very much in its first ‘baby steps’) is called buildingroehampton.blogspot.com.au. Roehampton is the place in England where my husband was born, so it was a fitting name for our new Hampton’s inspired home. Belinda thank you for sharing! What a lovely article and the photos are amazing too! I love how you put together these information on “tips for designing an organised home”. Easy to read, very relatable and great tips! Can’t wait to read more! FYI…you are interchanging a Butlers Pantry with a Storage Pantry. 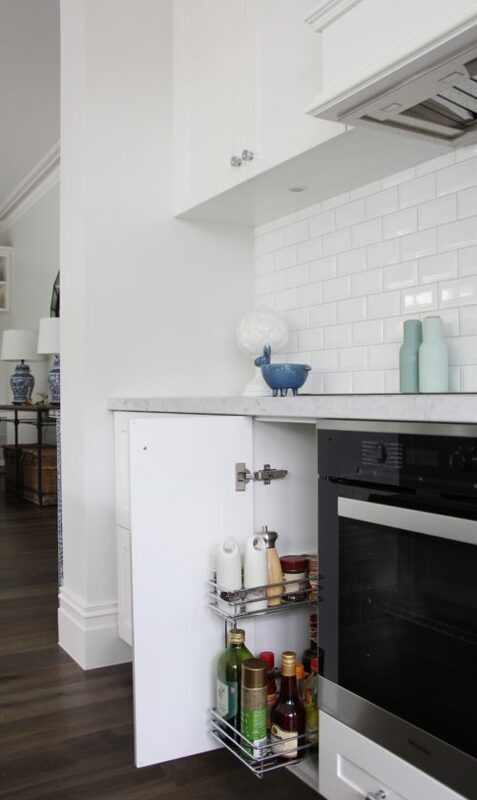 A Butlers pantry is a walk thru area usually connecting the Dining room and kitchen, which as you stated in one part of your blog was used to hide dirty dishes during a dinner party, so true and handy. Usually this space has cupboards for serving dishes and a sink. A storage pantry is usually only open shelf storage, some enclosed cupboards at times, but a definite different and separate function than a Butlers pantry. Thought you would not mind a technical check. Would you mind sharing the kitchen, pantry, mudroom layout in a drawing? I’d like to visualize your ideas into my current layout and flow. Hi Kim, that’s a good question! I dust once a week and the work surfaces get a wipe down weekly too (except the kitchen which is usually daily). Thanks! Sounds like just good ole’ fashioned regular cleaning not a special cleaner or dirt repellant to maintain.